Florida Attorney General Pam Bondi, left, Gov. Rick Scott, CFO Jimmy Patronis, and Agriculture Commissioner Adam Putnam talk before a state Clemency Board meeting in March. Florida’s Cabinet is reopening the search for a new banking regulator, just months after dozens of people applied without anyone being picked. Former Gov. 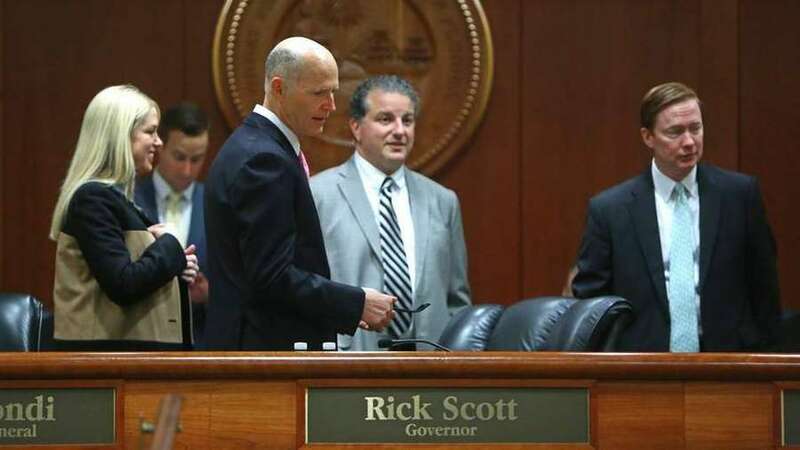 Rick Scott and the Cabinet opened applications last summer, after Chief Financial Officer Jimmy Patronis forced out the previous commissioner of the Office of Financial Regulation. But while many applied for the job, including former state representative and former banker Jay Fant, the Cabinet apparently chose to leave the position open to the new governor and Cabinet, which took office this month. Deputy Commissioner Pam Epting has been leading the office since then. OFR licenses and regulates banks, check-cashing stores and payday loan operations. According to OFR, applications are being accepted through Feb. 14.